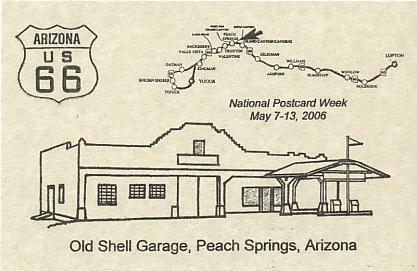 "Historic Route 66 in Arizona"
Every year the first full week in May is designated National Postcard Week (NPCW). Many postcard collectors design and publish their own postcards to commemorate this week, and, they trade with other collectors who make NPCW postcards. 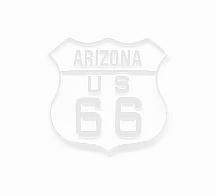 The theme for my NPCW postcards is and will continue to be vintage buildings and structures along old U. S. Highway 66 in Arizona. Here are the postcards I have produced. Please contact me mountgen@cox.net if you would like to trade NPCW postcards. I will also sell them -- contact me for details. 2017. 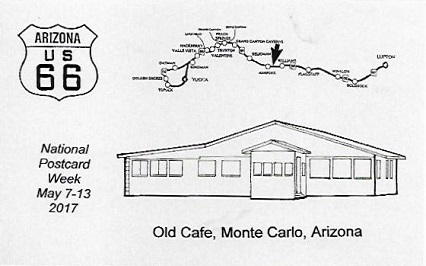 Old Cafe, Monte Carlo, Arizona, on historic U. S. Highway 66. 2016. 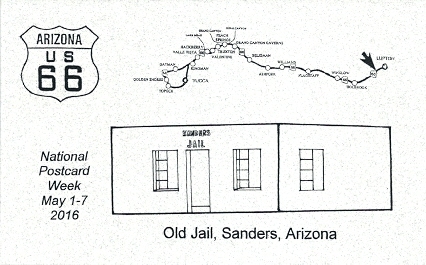 Old Jail, Sanders, Arizona, on historic U. S. Highway 66. 2015. 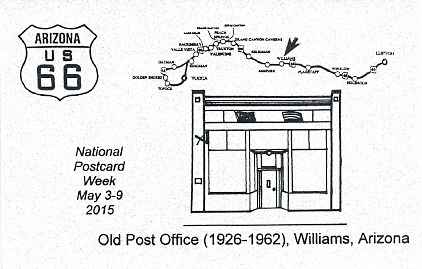 Old Post Office (1926-1962), Williams, Arizona, on historic U. S. Highway 66. 2014. 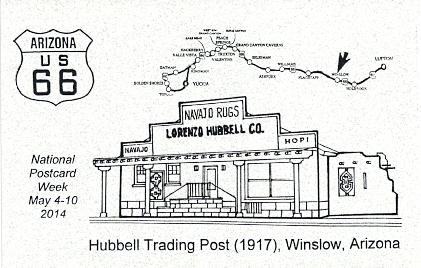 Hubbell Trading Post (1917), Winslow, Arizona, on historic U. S. Highway 66. 2013. 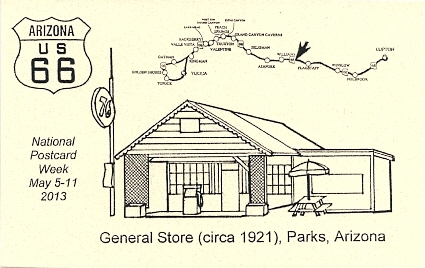 General Store (circa 1921), Parks, Arizona, on historic U. S. Highway 66. 2012. 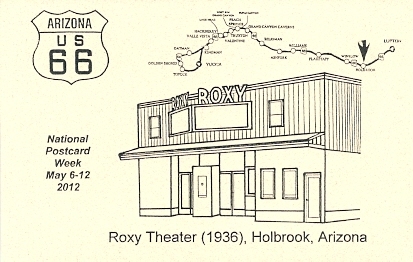 Roxy Theater (1936), Holbrook, Arizona, on historic U. S. Highway 66. 2011. 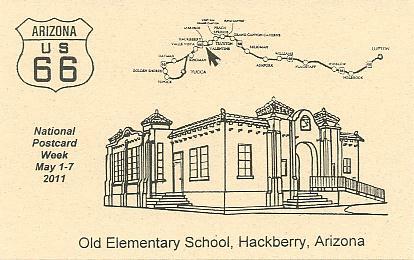 Old Elementary School, Hackberry, Arizona, on historic U. S. Highway 66. 2010. 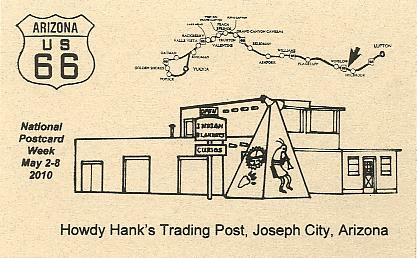 Howdy Hank's Trading Post, Joseph City, Arizona, on historic U. S. Highway 66. 2009. 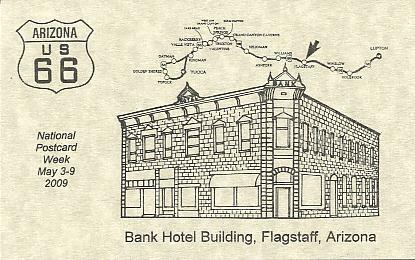 Bank Hotel Building, Flagstaff, Arizona, on historic U. S. Highway 66. 2008. 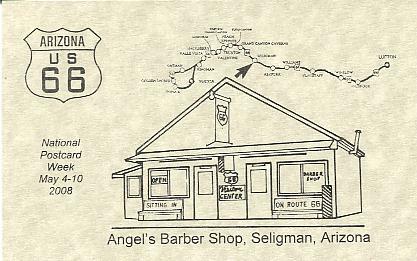 Angel's Barber Shop, Seligman, Arizona, on historic U. S. Highway 66. 2007. 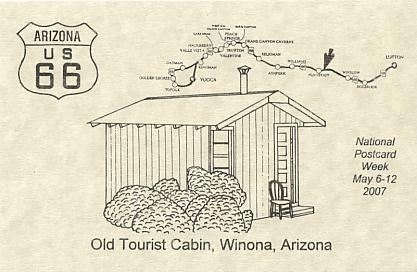 Old Tourist Cabin, Winona, Arizona, on historic U. S. Highway 66. 2006. Old Shell Garage, Peach Springs, Arizona, on historic U. S. Highway 66. 2005. 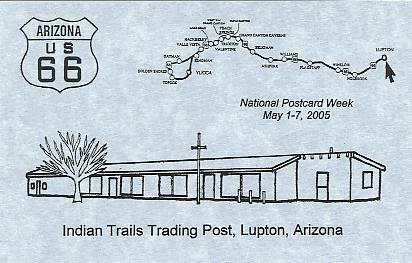 Indian Trails Trading Post, Lupton, Arizona, on historic U. S. Highway 66. 2004. 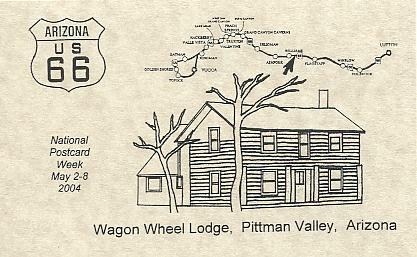 Wagon Wheel Lodge, Pittman Valley, Arizona, on historic U. S. Highway 66. 2003. 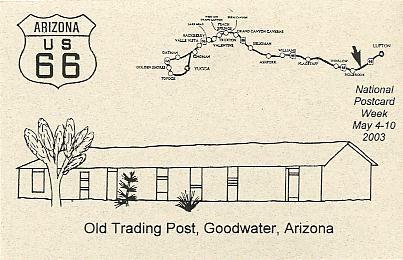 Old Trading Post, Goodwater, Arizona, on historic U. S. Highway 66. 2002. 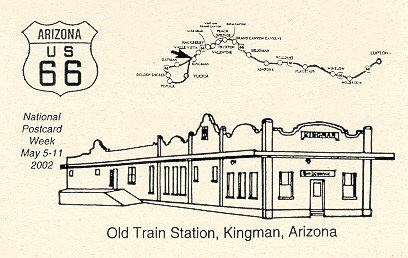 Old Train Station, Kingman, Arizona, on historic U. S. Highway 66. 2001. 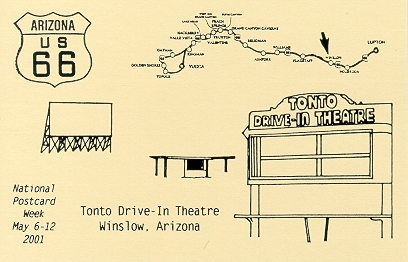 Old Tonto Drive-In Theatre, Winslow, Arizona, on historic U. S. Highway 66. 2001. 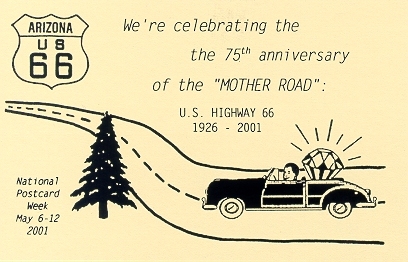 Celebrating the 75th Anniversary of the "Mother Road" on historic U. S. Highway 66. 2000. 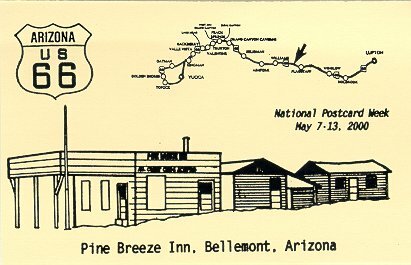 Pine Breeze Inn, Bellemont, Arizona, on historic U. S. Highway 66. 2000. 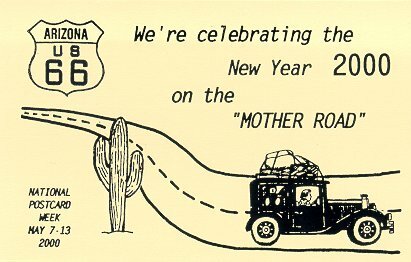 Celebrating the New Year 2000 on historic U. S. Highway 66. 1999. 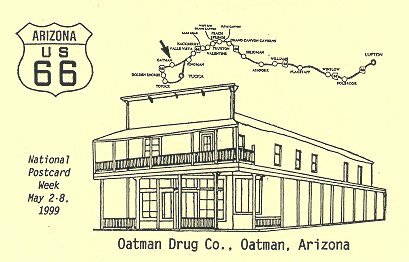 Oatman Drug Co., Oatman, Arizona, on historic U. S. Highway 66. 1998. 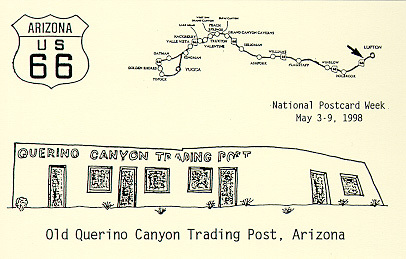 Old Querino Canyon Trading Post, Arizona, on historic U. S. Highway 66. 1997. 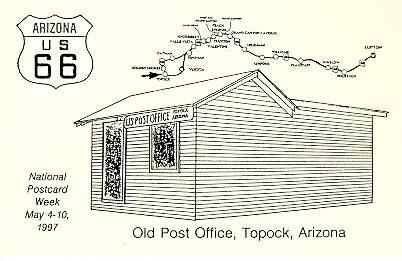 Old Post Office, Topock, Arizona, on historic U. S. Highway 66. 1996. 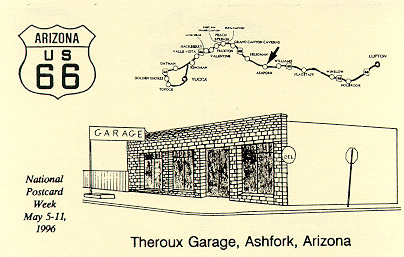 Theroux Garage, Ashfork, Arizona, on historic U. S. Highway 66. 1995. 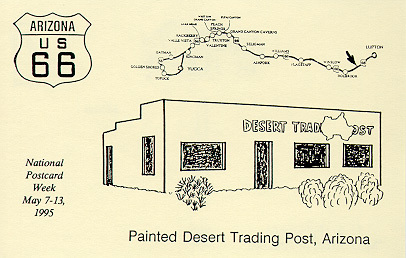 Painted Desert Trading Post, Arizona, on historic U. S. Highway 66.